I am humbled and ecstatic to have Mr. Thaddeus Miles here on The Black Lion Journal as an interviewee. I have featured many of Mr. Miles’s images here since the Journal’s inception; and I have been blessed to have found his images early on. Everything that he has done so far has been an inspiration. His start of Faces: Up Close & Personal was truly the cherry on top of his well-known 365 photography project. Faces: Up Close & Personal asks us to shift our perspectives by shifting negative narratives toward ones that uphold positivity, strength, and value. It started as a 365 photography project but has since expanded beyond 365 days. I asked Mr. Miles if he could take some time off of his busy schedule to talk to us about Faces, photography, and community membership and community action. Hello Mr. Miles! I hope you are doing well! I want to thank you for taking your time to answer a few questions for us to know more about you and what you do. I have been an avid follower of your work since I first saw your images a few years ago and since I asked if you would permit me to feature your work on the Black Lion Journal. I think it is becoming more critical for individuals to express strength through culture and community — and you have done an incredible job at redefining a negative narrative into one that is positive and up-lifting. Photography and the arts are crucial areas of influence that reflect and redefine moments of our lived experiences; they help us understand the lives of others literally from a different perspective, a different lens. In your work, you have taken images of hundreds of individuals and have shown life through your lens. What does it mean to you when we smile for the camera? People aren’t always comfortable with photos because I think we innately know they reveal things we are trying to mask. And sometimes they simply expose things that make us uncomfortable — even if it’s positive. Since the faces project restricts my shot to less than one minute and no more than five shots I don’t usually ask for a smile, I usually say “give me some love” while I give them a big smile. Asking someone to “smile” is my attempt to transition my subject to a place where they are genuine and transparent…the same way I see them through the lens. When I click the shutter I am hoping that the beauty I see is translated into the final image and also translated back to the subject. I am always surprised at how much people are appreciate that I would choose to take a photo of them. This leaves me feeling honored. 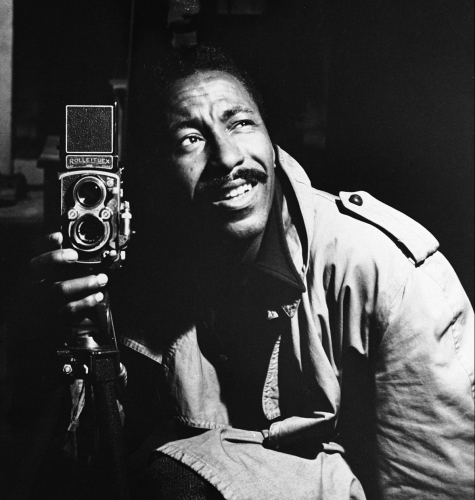 You talk about what Gordon Parks says, that the camera is a weapon against poverty, racism, and other social wrongs, on your about page; this is true and extremely relevant today. How does photography create strength and positive action? Which Photographers have inspired you the most with your work and with fulfilling your mission? Change has never taken place through words alone; it is the combination of images that give the narrative strength. If used correctly photography can inspire an individual, organization or entire community to become positive agents of change. There’s plenty of evidence of this from narratives related to slavery, the civil rights movement and even including the recent national Freedom March that words can co-exist with imagery for a more powerful explanation of truth. ● Ellis Reed is an American photographer and photojournalist. Reed was the first full-time black photographer employed by Magnum Agency. Faces is a powerful project in and of itself; but even more so because your subjects are members of your community and of those that you visit. How does your community, and community in general, influence Faces and your goals for the project? What do you hope to reveal wth your camera, your weapon against all that is socially negative and hurtful? The fact that the community is willing to celebrate and embrace my project is wonderful but the real honor feels like it lies in the discussions that take place in reaction to the photos. My blog and Facebook posts are able to capture the conversation about changing the narrative because the images spark a curiosity and also a familiarity. It is powerful for me to witness these transactions once the photo has been shared. There are so many stories and recollections I have witnessed being generated from my photos. So when it comes to Black and Brown boys I hope there is a way my photography can help them see immediate reflections of beauty and power in images that reflect their own faces. I hope to use my camera to show the diversity of a culture. The power of perspective: How we see each other/us and to counter the enormous amount of negative imagery that is pushed out every day through social media, television and the music industry in the complexities of today’s environment. I am looking for a tool to create unity. We knew that Faces was intended as a 365 photography project when you started. And near the end of last year, we thought that it had ended; that is, until you decided to continue it which I, and many others, were glad to hear. Faces truly is a project that transgresses yearly limitations because it is about the story of life and of people — something that is always evolving. How far are you planning on taking Faces? What are your future plans for Faces? I have realized that I am enjoying creating this as much as I hear others react to how much they are enjoying viewing the photos. I am planning to shoot up to 1,000 photos. This will push me to get out of my comfort zone- force me to take photos of people other than the ones I can easily access. My future plans are that I hope to have several dialogues around race in Boston through existing community discussions re: race and healing and I would love to have a show that mirrors these discussions using photography. Finally I would like to create a book of imagery where the proceeds can go toward something with impact at a community level. What quick tips can you give to those who want to start their own photography projects within their communities? ● Explore as many projects online or in books as you can. ● Keep the project simple. ● Don’t let anyone talk you out of it. ● Create a plan and go for it! I have been aware of your many roles, not only as a photographer, but as a Father and as an individual that stands with your community. Recently you talked about My Brother’s Keeper (MBK) and your visit to the white house. I know that Mr. Obama also talked about the strength My Brother’s Keeper has had on the youth, especially on preventing incarceration. For people who may not know much about it, can you tell us what it is, what it does for the youth and communities in America, and how My Brother’s Keeper helps your community? MBK is legacy from the Obama presidential initiative to increase resources for boys and men of color throughout the country. Some of the staple interventions include mentoring and increased engagement in academics. The Boston MBK initiative helps our local community as it brings focus to this same area by galvanizing resources across many contributors from the city. As an example, by working together we took twenty (15 youth and five adult) to tour the newly opened African American Museum and The White House to learn about their history. Additionally we have mini grants being offered to grass roots organizations who are explicitly working with Black and Latino boys. MBK Helps people come together who are working in like-minded ways by providing resources for small, powerful, less acknowledged programs; by beginning to change the narrative on what success and leadership mean and how they are defined; and by provide engagement opportunities and career pathways to living wage employment. From their website, My Brother’s Keeper does great work at gathering communities together and spurring action. You have also taken upon yourself to contribute to your community and to the young people living in it. How important is it for communities to serve and support the youth? It’s extremely important that we all contribute to our young people with authenticity. One effective intervention for individuals who are not hopeful is for them to experience being a part of making a collective impact. Sometimes it’s so hard to feel like as a singular entity that it is possible to create change that’s meaningful, so structures like MBK are critical to bringing together masses who care about similar things and giving them a vessel in which to focus their energies. Can you tell us a bit about what Hood Fit does and your role with it? How does Hood Fit blend with your community goals? How does it serve and support the youth? HoodFit is a series of intentional and actionable interventions that help folks transition from a disconnected sense of self to a becoming aware, step by step. HoodFit expresses that “wellness” has multiple entry points, all which need to be in sync to create wellness: Mind, Body and Soul. HoodFit is an extension of my own need to constantly get better at being “well”. HoodFit is my reminder that what surrounds me is a loving community of people who will always embrace me if I show up being authentic and committed. There are six points of influence: Determination, Grit, Vision, Love, Perseverance and Resilience. Young people need to see the adults in their community taking risks to foray into territories that may be uncomfortable or unfamiliar in order to become “well” so HoodFit is the best way I can offer these access points. It is evolving and taking shape. Within the next 9-12 months HoodFit will become a more established series of activities both here in Boston and across the national landscape. I know there are those out there, myself included, who feel daunted about where to start with their communities, about where to take up action. What advice can you give for young people out there who feel that they can’t make a difference in their own lives and in the lives of others? First, remember that there are plenty of examples of young people who have made a major difference in their community. Second remove the “dream crusher’s” out of your network. Finally, know You can always make a difference if you are focused and intentional. The reason why it feels so hard to make a difference is usually not because of the work we are trying to offer others but because we have not finished the work of ourselves. Taking care of ourselves first sometimes might seem selfish or short-sighted but I believe we simply cannot help anyone else if we aren’t clear about what we are bringing to the table: good and bad. And what advice can you give others that want to become mentors to their community’s youth? First recognize mentoring is a two-way learning environment. It is special and you should embrace every moment and opportunity. Thank you so much Mr. Miles for your time and for answering these questions! I appreciate what you do and your work with photography and with your community. I look forward to seeing what else you have in store! If you enjoyed reading this interview, please share with your friends and family by clicking on the social media buttons below. On behalf of this Journal, I am honored to have interviewed Mr. Miles. Catch him on his Twitter, on Faces: Up Close & Personal, here on The Black Lion Journal, and on the Journal’s Digital Museum. Tags: 365 Photography Project, Black Lion, Black Lion Journal, Boston, Community, Faces, Faces Up Close & Personal, FEATURED POST, Hood Fit, Interview, MBK, Mentoring Young People, My Brother's Keeper, photographers, Photography Expert, Professional Photographer, Thaddeus Miles, Thaddeus Miles Photography, The Black Lion Journal. Bookmark the permalink. Great Interview with Mr. Miles, I love the works he does! I also appreciate the man, he’s genuine, and cares about the welfare of black and brown young boys and men throughout the city and country, then he puts the resources behind it! Agree! Thank you for reading!